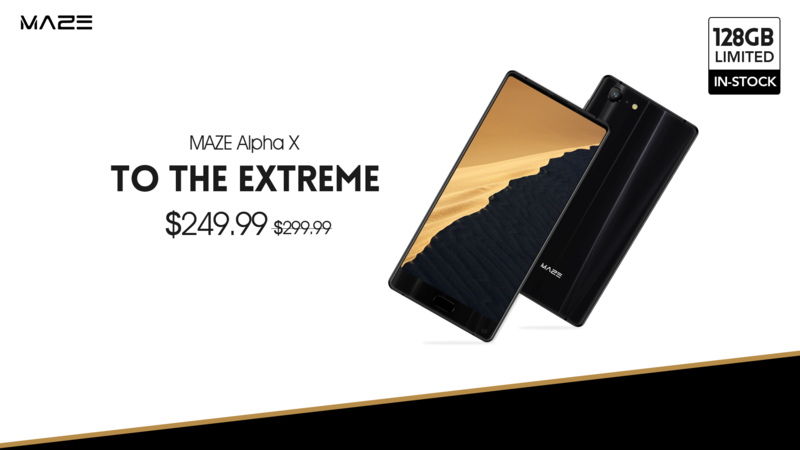 Developers frameless smartphone Maze Alpha X reported that the version of the device at 128 gigabytes is already available for purchase in the store GearBest . Frameless Maze Alpha X received a 6-inch Full HD + display manufactured by LG with a resolution of 2160 by 1080 pixels, an aspect ratio of 18: 9 and a protective glass Gorilla Glass 5. Another feature of the device was a dual rear camera with Sony modules at 16 and 13 Mp. Two versions are available: with 6 GB of RAM and 4 GB of internal memory, as well as an option for 6/128 GB. At the heart of the Maze Alpha X was the 8-core chip MediaTek Helio P25, and for the autonomy is responsible for a battery capacity of 3900 mAh. The operating system is Android 7 Nougat. Under the screen there is a button with a built-in fingerprint scanner. The back glass panel is equipped with a protected glass Corning Gorilla Glass 4. The approximate price for a 64 GB version is $ 200. For the option of 128 gigabytes will have to pay about 290 US dollars. The elegant frameless Maze Alpha X is already available in the GearBest store . More information about the novelty can be obtained on the official website of Maze .